Washer Fluid Cap Cover 02-14 Dodge, Chrysler, Jeep Billet Washer Fluid Cap Cover 02-14 Dodge, Billet Washer Fluid Cap Cover 02-14 Chrysler, Billet Washer Fluid Cap Cover 02-14 Jeep, Billet Washer Fluid Cap Cover Dodge Magnum, Billet Washer Fluid Cap Cover Chrysler 300C, Billet Washer Fluid Cap Cover Dodge [American Brother Designs 3257WC] - $49.95 : 3rd Strike Performance, Your Source for Late Model MOPAR Performance Parts and Accessories! 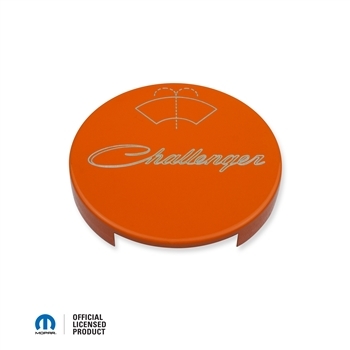 Mopar licensed washer fluid cap cover. Professionally machined and painted, made from premium billet aluminum and finished with a durable paint coat as sleek and beautiful as the one on your Dodge, Chrysler or Jeep. Installs within minutes and made in the U.S.A. by American Brother Designs. Offered in your choice of finish. Each piece is expertly engraved. *Note: May fit other makes and models with this style overflow bottle. This item is custom made. Item ships direct from manufacturer. Average shipment time for this item runs 7-10 business days.